Do you love stuffed cabbage? 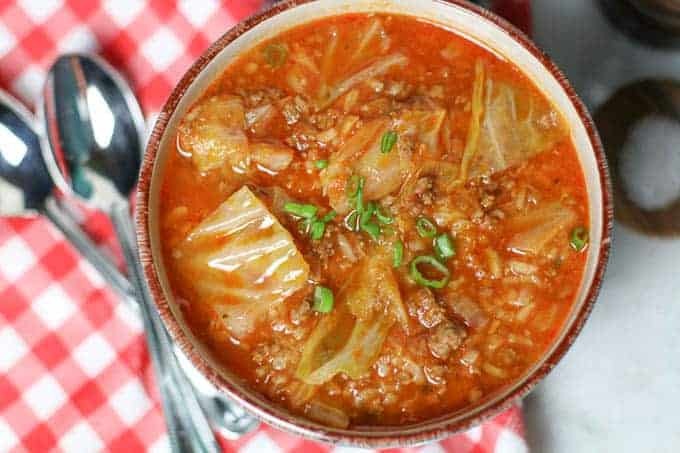 Then you will love this Instant Pot Stuffed Cabbage Soup recipe. It has all of your favorite ingredients of traditional stuffed cabbage thrown together easily in the Instant Pot. The result is a big bowl of warm, tasty, comfort food. I love little stuffed cabbage rolls. They make me think of my grandma. She would make them by scratch and serve them for dinner time to time. However, wrapping the meatballs in cabbage are a bit of work and time consuming. 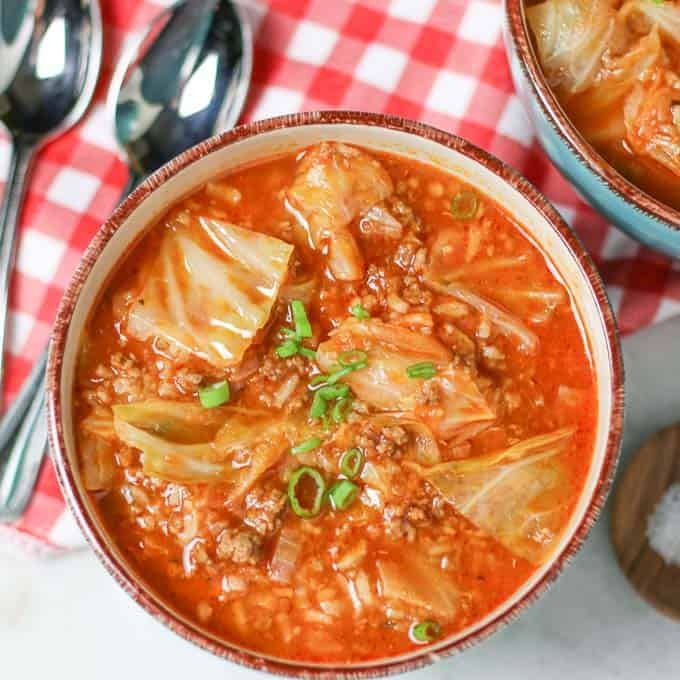 Luckily, this Instant Pot Stuffed Cabbage Soup recipe has all of the same tasty ingredients that make stuffed cabbage so yummy without any fuss! It is cooked in under 30 minutes and comes out PERFECT!! How great is that? You will definitely want to add this to your dinner rotation. 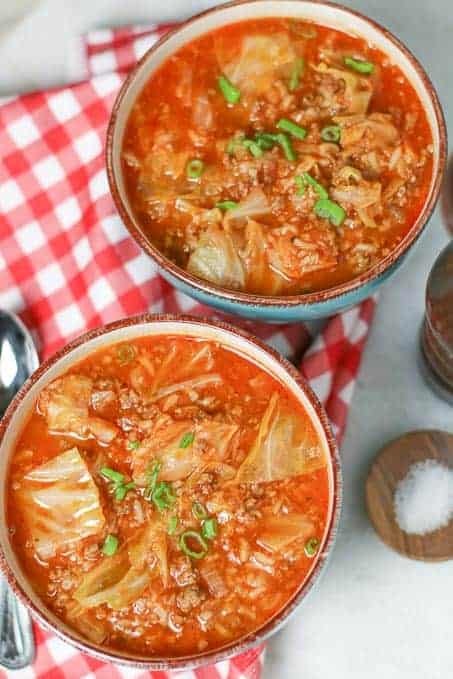 Making Stuffed Cabbage Soup is easy! First brown the onions, ground beef, and breakfast sausage. You can use mild or hot depending on how spicy you like it. I prefer hot. Close and lock lid. Turn on manual high setting for 4 minutes. Once done, natural release for 5 minutes. Then do a fast release for any additional time. Didn’t I tell you it was easy? I have a delicious Instant Pot Stuffed Pepper Soup Recipe also if you like this one!! It is a hit in our home as well. Cook onion, ground beef, and breakfast sausage until fully brown. Drain grease. Close and lock lid. Turn on manual high pressure for 4 minutes. Natural release 5 minutes, then quick release any remaining time. 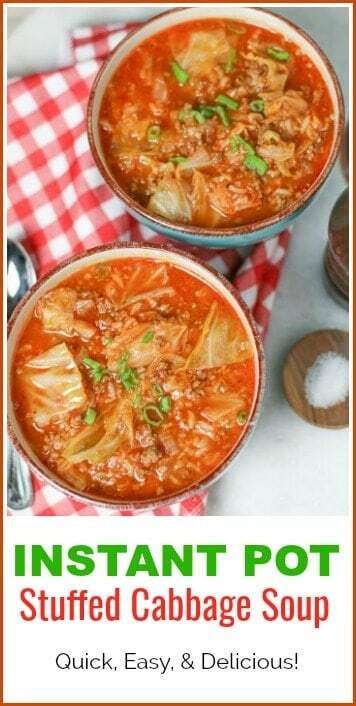 You can use hot or mild breakfast sausage based on how spicy you like your stuffed cabbage soup. I like mine hot.